Shelley is no stranger to clay and making ceramics. Her first memories are of being given a small ball of clay in her father’s studio and of course putting it in her mouth and discovering that was not the purpose of clay. Next came hitting it about with sticks and making textures and probably gluing it to the floor. Many years on Shelley is still interested in clay textures and in fact has progressed onto becoming a potter herself. Her journey led her to Melbourne’s Swinburne Uni. To study painting, textile design and printmaking. On returning to the Sunshine Coast she reawakened a passion for clay and set about teaching herself to throw on a wheel, fire a kiln and open the doors to a lifetime of interaction with the fusion of earth, water and fire. What a challenge! The first successful works were painterly wheel thrown bowls with portraits of family, pets, birds and fishes. Here an investigation of the surface with sgraffito started her adventure in textural ceramics..
Having always been a fossicker in op shops and flea markets, pretty soon she started collecting an odd assortment of crocheted doilies and these were added to her woodblocks, embroideries, leaves and any unusual objects she came across. A new design range was developed incorporating thrown, draped and moulded shapes using the wheel and slab roller as tools. As the ware was to be functional and hopefully used in conjunction with producing gorgeous feasts, the glazes chosen were all semi and full gloss and plain, relying on the texture of light and dark shadows to create interest . 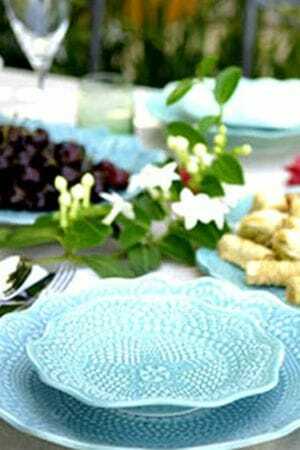 Now there are beautiful tropical turquoises, leafy deep greens, soft celadon and limey whites complimenting the many shapes of pots from large leaves to selections of noodle bowls and on through the full range of accoutrements one needs to serve a feast in style. Every day Shelley observes nature and culture around her and hopes to progress with new ideas and thoughts while always enjoying and being mindful of the great ceramic tradition that precedes her. Heres to earth, fire and clay.